When you escape from the busy freeways and urban arterials with heavy traffic, it's easy to let your guard down cruising the quiet side streets. Bigdawg Dan has been fidgety ever since he watched European road racing on TV last Tuesday. His right hand has been twitching and his soul is itching for a twisty road fix. As the week unfolds, Dan checks his tires, tops off the oil, runs a rag over the chrome, oils up his leathers and polishes his face shield one more time. The weather report Thursday night promises sunny on Friday, rain by Saturday. While he's been futzing with the bike, Dan has been formulating a believable medical excuse for the boss. The weather report clinches the decision: Friday morning, instead of heading for work, Dan calls in sick, suits up, and points the bike through commuter traffic toward his favorite back road. Even as he carves through frustratingly slow traffic, he's slicing through those turns in his mind. To make better time, Dan cuts over to the side streets he knows so well. But before Bigdawg can get out of town, a car zips out of an alley, directly into Dan's path. Like the sleepy driver, it takes Dan a moment to wake up to what's happening and that extra reaction time seals his fate. Too late getting on the brakes, Dan slams into the driver's door and catapults over the roof. Luckily, he isn't seriously injured, thanks to the serious riding gear he decided to wear today. But the bike's front end is wrapped back under the engine, and this machine isn't going to go anywhere soon. The ride is over. Now Dan can honestly fulfill his sick-leave prophesy with a sprained shoulder. Yes, drifting through the twisties is exciting. We're basically trying to emulate the road racers without having to buy track time or get serious about skills or leathers. In my opinion, there's nothing wrong with enjoying quick riding, but there's a lot more to motorcycling than emulating the racers. Remember, a lot of your riding time is in urban traffic. Even if you're headed out to the country, you've got to get through the suburbs first. Multi-lane highways might appear to be a hazardous riding environment, what with the big volumes of traffic and the higher speeds, but the statistics hint that freeways are safer than undivided highways. Most motorcyclists have figured out that urban (city) intersections are our biggest nightmare, complete with cross-traffic, multiple lanes, strange intersections, confusing signals, pedestrians, taxi cabs, delivery trucks, busses and lots of aggressive driving as frustrated motorists attempt to get somewhere faster than everyone else. Sometimes just getting through a busy parking lot can be a major skirmish. When you can escape from the freeways and heavy traffic and cruise down a quiet side street, it's easy let your guard down. When you escape from heavy traffic and cruise down a quiet side street, it's easy to let your guard down. The first step in avoiding any of these suburban hazards is planning ahead. The basic evasive maneuver (for everything except loose dogs) is aggressive braking. Whether you are riding a freeway or a side street, you should always be able to stop within your sight distance. The big problem with narrow residential streets is that your sight distance may be only to the end of the car you are riding by or to that overgrown hedge at the next corner. A child could be ready to dart out from between the cars, for example, or a skateboarder come zipping out from behind the hedge. So, your speed through residential neighborhoods must be slow enough that you can make quick stops with very little warning. When approaching a blind intersection where you can't see traffic on the side street, plan on a stop to look, just as if there were a STOP sign. Assuming you have the right-of-way is an invitation to an embarrassing get-together. And when you do encounter a STOP sign, get in the habit of making a complete, left-foot-down stop. Lots of riders who only intended a slow-down when rolling by a STOP sign or blind intersection have been surprised by cross traffic and ended up stopping their machines horizontally. When approaching a blind intersection where you can't see traffic on the side street, plan on a stop to look, just as if there were a STOP sign. 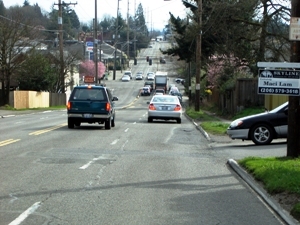 Side streets often have more surface hazards than busier arterials. 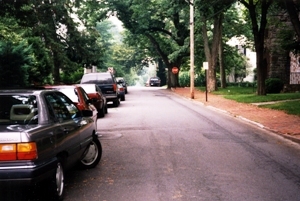 Street crews tend to ignore problems such as pavement ripples or sunken drains on little-used side streets. So, while you're scrutinizing the situation for the usual vehicle, child and animal hazards, don't ignore the road surface. 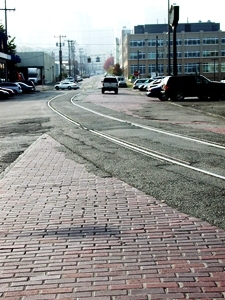 In older cities, there are still streets with brick paving, and bridges with wooden decking. Bricks or wood may seem to have good traction when dry, but can be amazingly slippery when wet. What happens is that the brick dust or wood fibers mix with water to form a slimy lubricant which is the same color as the surrounding surface. You can't see the slippery stuff, so just remember that wood or brick surfaces can be treacherous when wet, even from a little dew. Both wood and brick surfaces can be treacherous when wet. 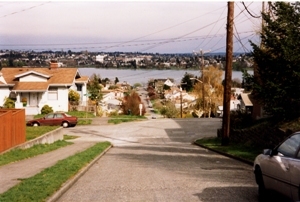 You're also more likely to encounter pavement ripples or grooves on side streets. Where there are mature trees alongside, expect ripples from tree roots growing under the paving. There are also lots of side streets where the paving suddenly changes to gravel, or the road narrows or the sidewalks disappear. 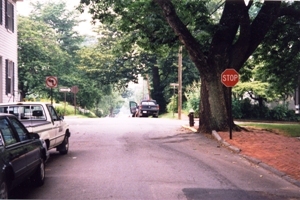 On shady side streets, watch for tree root bumps in the pavement that could cause your suspension to bounce just when you're trying to brake. In newer neighborhoods, you can expect edge traps, dips and bumps created by the installation of underground pipes and wires as new houses are constructed. Expect manhole covers or drain grates that didn't work out to be the right elevation for the paving, but never got fixed. Remember, manholes and grates are usually located at intersections, right where your attention is demanded for the moving targets. In climates where the temperature dips below freezing in the winter, expect loose sand at the edges of the wheel tracks each spring. Wintertime street sanding operations often leave sandy berms that are most obvious for a month or two after the spring thaw. Watch carefully at intersections where the sand berms collect near the curb and close to the centerline. 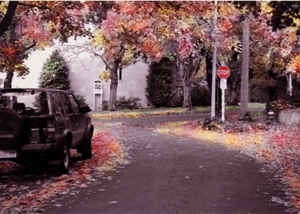 In autumn, treat fallen leaves with respect. You may get this creative idea to go blasting through a big pile of leaves in the gutter, but think twice about that. Even if the leaves are dry on top, there is often a soggy-slippery layer of rotten vegetation on the bottom, down where your tires are looking for a grip. Or perhaps there are some hidden "ball bearings" in the form of acorns or chestnuts. Maybe there is a loose brick or a sunken drain grate hiding under the leaves, waiting to bend your wheel rim. You can chance the leaf blast if you want, but let's not hear any sniveling if it doesn't work out as creatively as in your imagination. You may want to think twice about blasting through a big pile of leaves in the gutter that could be hiding a sunken grate or collection of acorns. One important admonition about riding familiar streets: wear your riding gear especially when you don't think the situation demands the precaution. Like Bigdawg Dan, you know there are hazards of taking a soil sample when you're blitzing a twisty road at warp speeds, so it's a no-brainer to suit up for the good stuff. But hey, for a one-mile trip to the convenience store, it's a lot of bother to zip on the armored pants and jacket, right? Just remember that those quiet, innocent-looking side streets and alleys can spring sudden hazards on you just as quickly as your favorite twisty road, and that a collision with an SUV can be just as violent as sliding off a curve. David Hough is a long-time motorcyclist and journalist. His work has appeared in numerous motorcycle publications, but he is best known for the monthly skills series "Proficient Motorcycling" in Motorcycle Consumer News, which has been honored by special awards from the Motorcycle Safety Foundation. Selected columns were edited into two books Proficient Motorcycling and More Proficient Motorcycling, both published by Bowtie Press. He is also the author of Driving A Sidecar Outfit and a pocket riding skills handbook, Street Strategies.